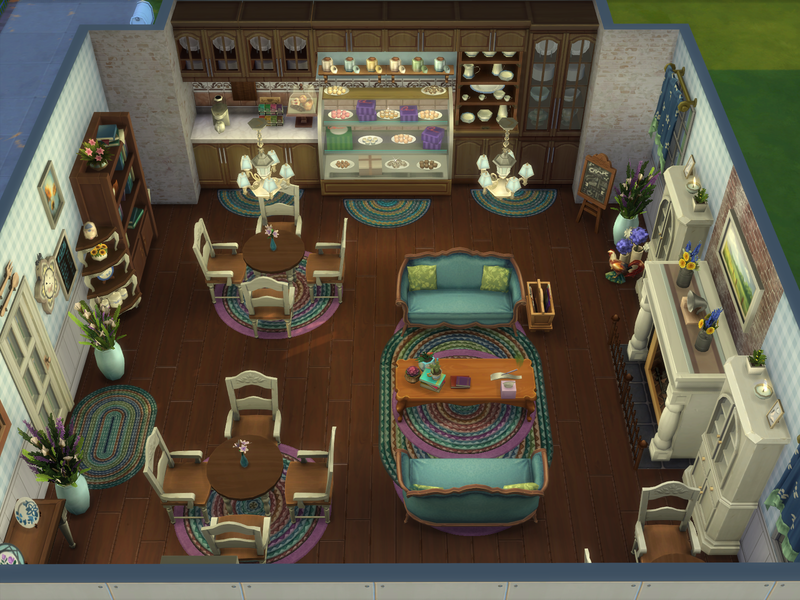 It is great that you have set up a showcase thread for your creations! Birdsong Starter is a very nice home! 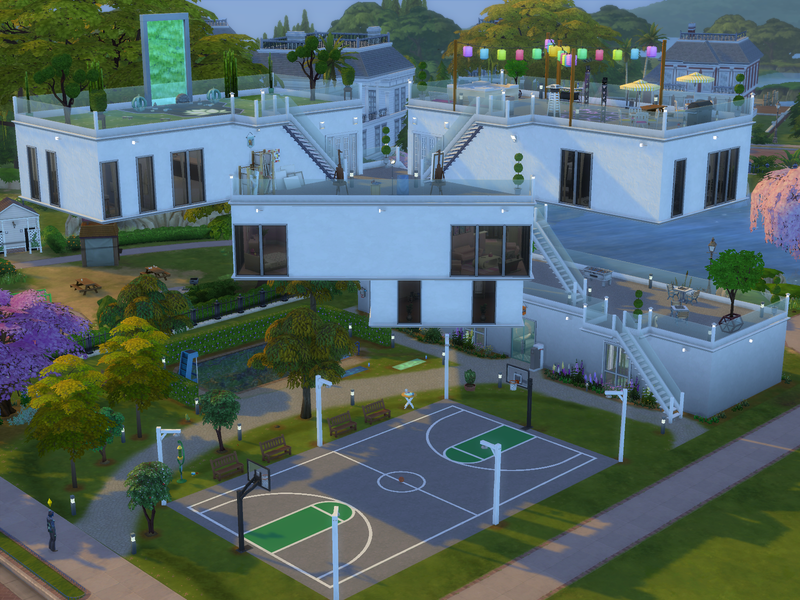 The open shutter windows look nice in the build. The flowers and plants look very nice in the corner nooks either sides of the front steps. Very nice back porch. 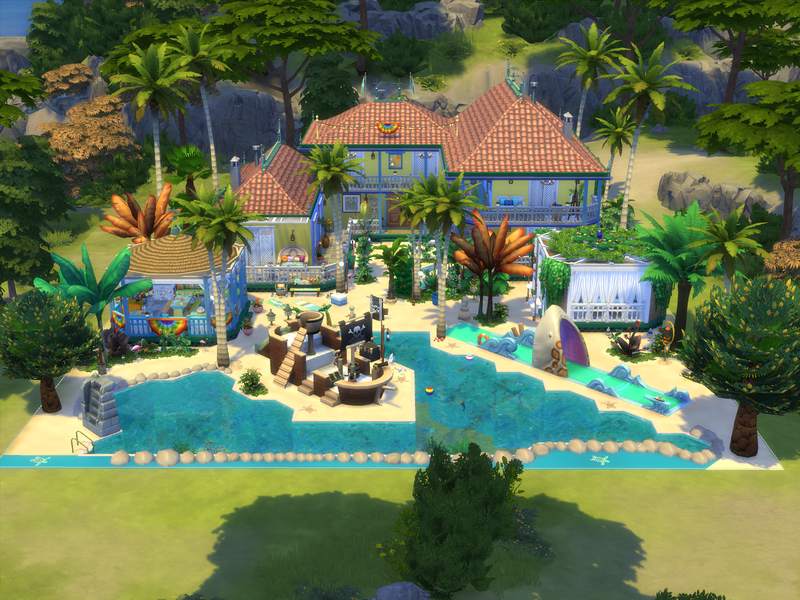 Sims will enjoy cooking meals on the BBQ there or enjoy painting on the easel in the outdoors air. Very nice layout and furnishing of the interior of the home! The wall pattern and brick wall texture looks nice. The coat stand and display shelves item either sides of the front door are homely touches. Very nice living room area. The sofas look nice how they are placed there. 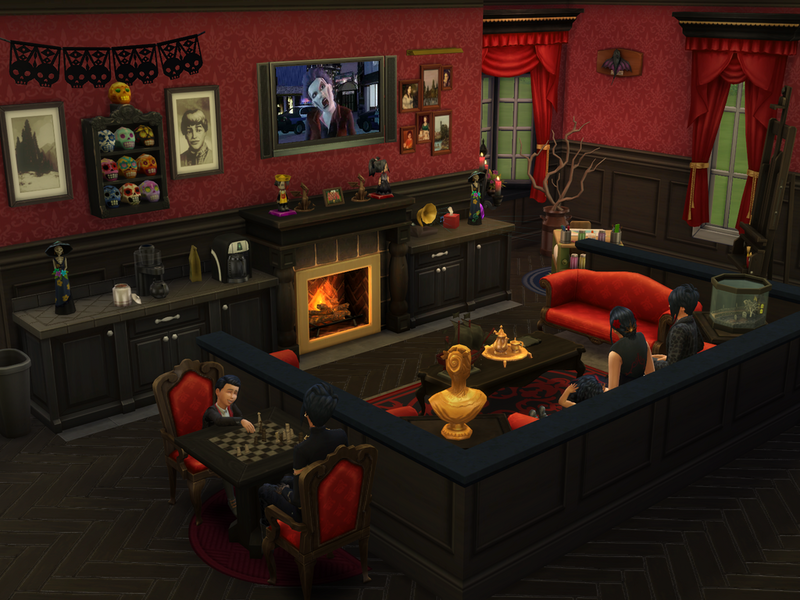 Sims will enjoy sitting resting on the sofas watching tv, chatting and reading a book from the bookshelf. They will have fun dancing to the music from the stereo! Nice study desk area for sims to enjoy sitting at the desk table using the computer. The books are a nice touch on the desk. Very nice design of the kitchen and dining room! The floor texture looks nice. The island sink counter is great! The fruit bowl, bottles, knives and utensils on the counters and the teaset on the dining table are nice kitchen and dining touches there. Very nice bedrooms. Nice science nook in the kids bedroom. 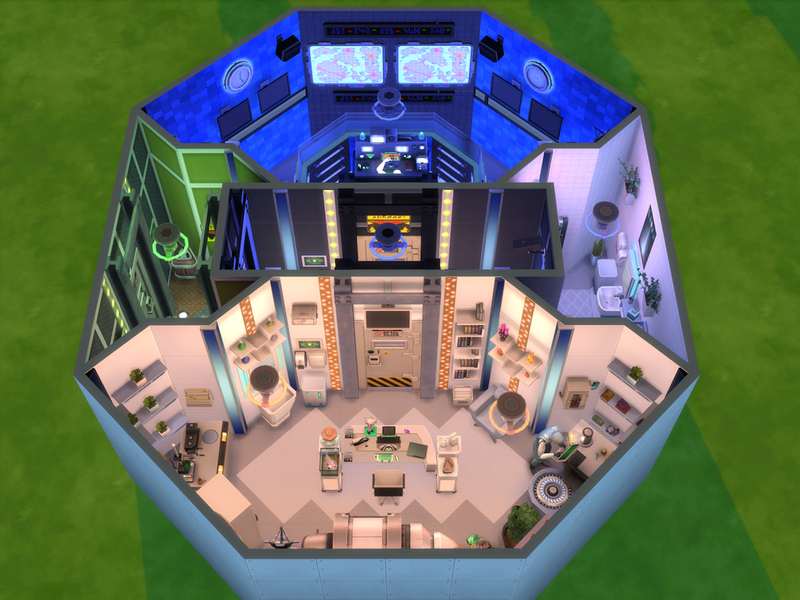 Sims will enjoy doing experiments on the science table. The wall tiling in the bathroom is very nice. The hanging robes are nice home touches on the bathroom wall. Edit : I was looking at your home again and the gardening box area is very nice! The lavender looks pretty around the edges of the gardening boxes, and the rabbit and the rooster look great there! Sims will enjoy growing and harvesting plants in the box. I love your build! The interior is my favorite. 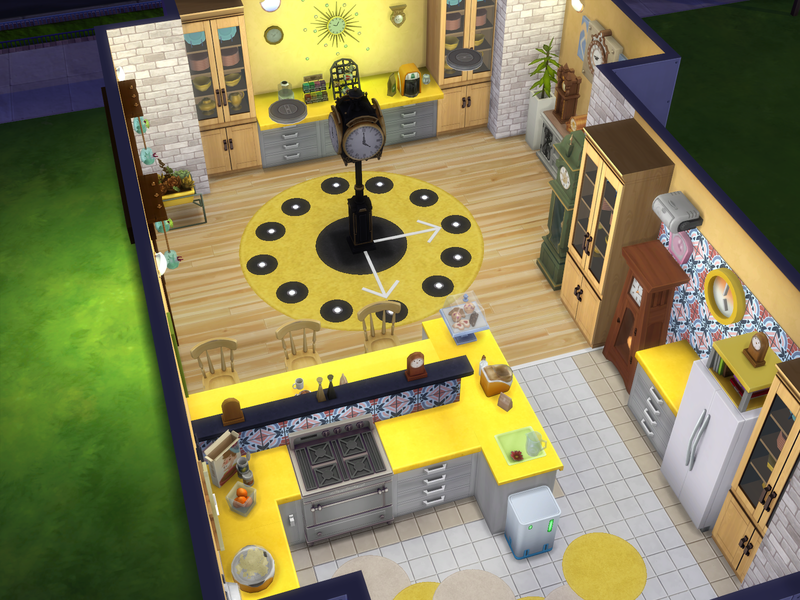 I really like the kitchen, especially with all of the dark colors. The cabinets are also really nice, good job with the placement of the different types (I have just recently discovered this feature and am still working on making them look right). In the living room, I like all of the different walls types. It makes it have a contemporary feel with the dark brick wall (which was also well used in the kitchen). 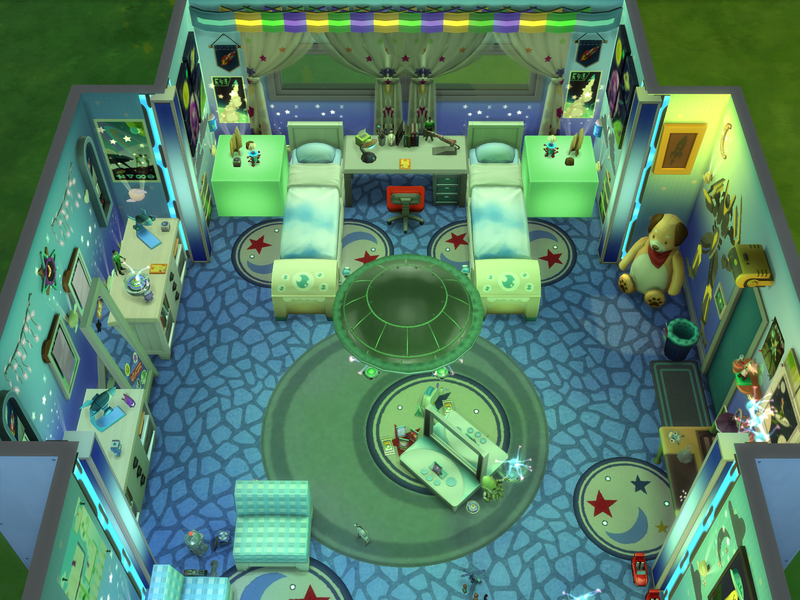 The dino theme in the kid bedroom is really nice. I also love the rounded deck in the back! My only recommendation would be to change the exterior a little. Maybe put two windows on either side. Or, extend the part that sticks out to line up with the triangle part of the other roof? You could also make this a different wall color (the dark brick form inside would look nice). Thank you @seaofseneca I'm glad you like it and thanks for the tip and won't you come and join at QC Create a Room we have lots of fun and making friends as well. Comfy Cubby is a very nice home! The backyard area is very nice! The roosters, bunny and hen/basket of eggs around the tree look very great! Nice outdoors dining area for sims to enjoy cooking on the grill and eating their meal at the picnic table in the sunshine. The gardening nook is nice. 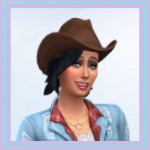 Sims will enjoy growing and harvesting plants in the gardening boxes. The hose on the wall and the watering can are nice touches there. The flowers look very pretty lining the edges of the front pathway and the front porch. Very nice furnishing of the interior of the home. The grey brick wall texture gives a great look to the home. The fruit bowl is a nice touch on the kitchen counter. Very nice living room area for sims to enjoy sitting resting on the sofa there watching tv and reading a book from the bookshelf. Nice study desk nook for child sims to sit at the desk table and do their homework. The blue colour scheme of the bedroom looks nice. The tissues is a homely touch on the bedside table. Lovely homes! I like that you placed those wooden boxes next to the trash can out front. It makes me think a family just got done moving in, and that's an awesome little detail that adds ambiance. The brick accent walls in your first build are awesome! I'm a huge brick and stone fan, so that just makes me giggle with glee. 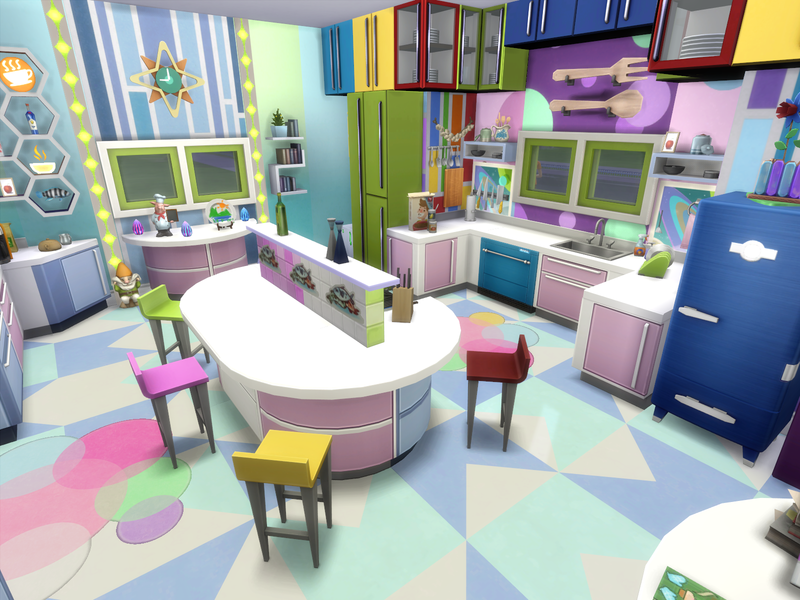 lol All the clutter in the kitchen and bedrooms is awesome!!! It gives me a realistic vibe and rocks! Such a great first build! This micro home is SO FLIPPIN' CUTE! The patio is adorably lined with flowering shrubbery, so cute and happy! The blue in the kitchen is really pretty and contrasts nicely with the dark brick (brick rules!). I love that the chairs aren't the same color as the kitchen table. It's a nice contrast and something I don't see often. It looks good and I like it! The back patio is awesome with the grass going wild and the chickens pecking through it. The little touches like the hose, simple patio seating, and gardening tools near the boxes are great. I really like this little house because it reminds me of the little homes in our surrounding area that are inhabited by good honest people that don't have huge elaborate "things" but are definitely treasures themselves. I get a fuzzy feel good emotion when looking at this house. Oi! That bar is super creative! The cabinets look great down there along the bottom and then the shelves above them are really cool! A mirror where the picture frames are in the center would really tie in all those things wonderfully. It looks good with the pictures there too, though! Cute patio spaces and the railing you chose is awesome! The chicken pen with all the grass and the birdbath is so cool! It's making me really want a farm EP or GP. lol I still love the clutter by the trashcan! Those pink flamingos are cracking me up (in a good way). Dusty Turf is a very nice home! The rocks and flowers on the edges of the home look very nice. Very nice layout of the interior of the home! The yellow colour schrme of the kitchen looks very nice and sunny . Very nice study desk nook. 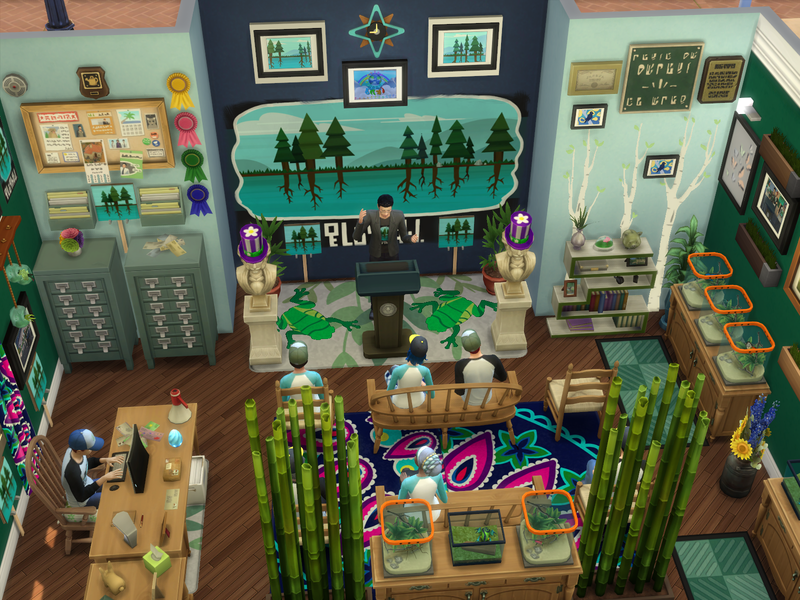 Sims will enjoy sitting at the desk table using the computer and looking out through the windows at the outdoors views. The coat stand is a homely touch beside the front door. Very nice dining area! 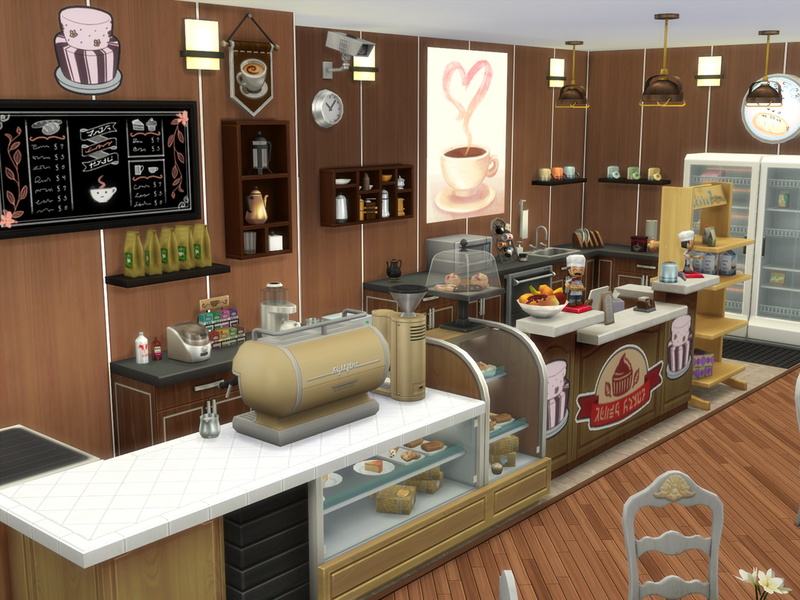 The fruit bowl on the dining table is nice for sims to see when eating their meals, and the drinks display shelves look nice on the wall. The family photos between the drinks shelves are homely touches there. The flooring through the home looks nice. The fenced chicken pen looks very great! The grass and the birdbath looks nice in the pen. Sims will enjoy growing and harvesting plants in the gardening boxes. Very nice outdoors dining patio! 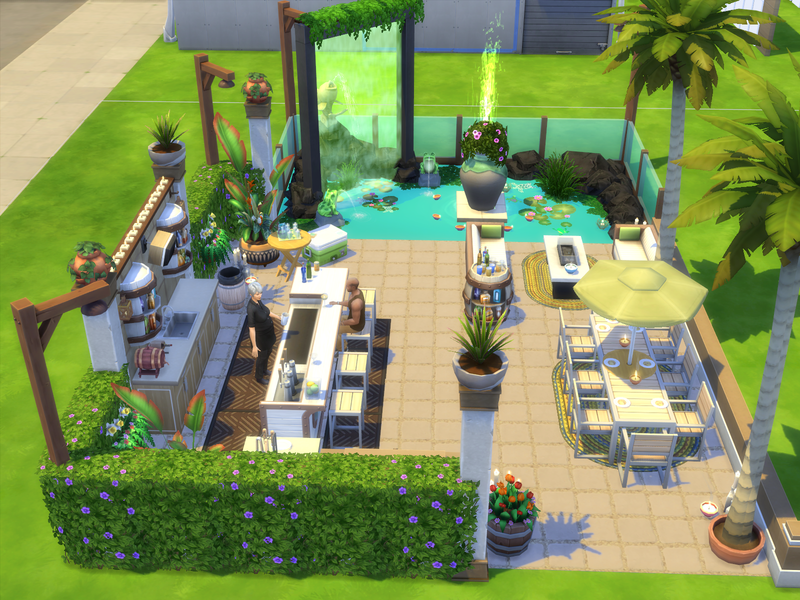 Sims will enjoy cooking meals on the grill and eating them in the sunshine at the umbrella covered table. The pink flamingos are nice touches in the back garden and the cactus plants look nice either sides of the steps. @Ceres_Meiriona Thanks for dropping by my showcase thread they're not that great just getting the feel of building and trying things out and I will be showing more and It should get a bit better and thanks for downloading Comfy Cubby and the way I build I love to clutter and make the place more realistic like in real life and you made me giggle about the pink flamingos Im' an aussie we have something like the pink flamingos but they're white and I think there called Ibis and you might find them in you garden and that's why the pink flamingos in my sims garden. And I mite and try build my childhood place next that will be my next project. And I remember you now I was trying to help you with finding your memories thread did you get any help with that. Pebble Burrow is a very nice home! The front porch is nice. The paving texture looks great. The chequered black and white flooring of the interior gives a very nice look to the home. Very nice design of the kitchen! The cabinets look very nice how they are placed on the wall there. They llok nice with the brick kitchen wall texture. The black,white and pink/purple colour schrme of the home looks very nice. 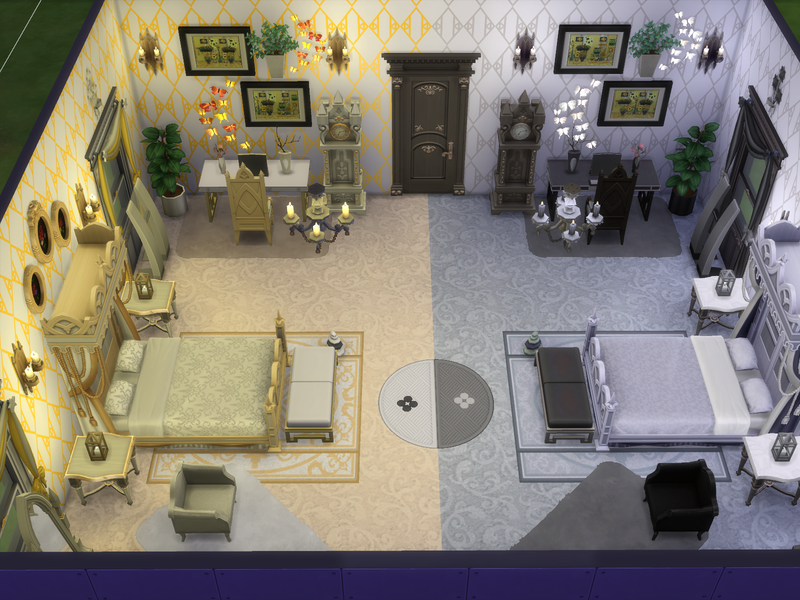 The Baby room looks so very cute! Very nice furnishing of the room! It looks very nice how there is the alternating green and yellow cabinets. The animal pictures on the wall and the giraffe, heart teddy, big teddy and lady bug look very cute in the room! The panda lamp is a nice touch on the table. The dinosaur floor rug looks very cute and nice under the bassinet! Very nice windows corner armchairs sitting nook. Sims will enjoy reading a book to the child whilst sitting there, wuth sunlight coming in through the windows.. The animal wall pattern and the animal prints on the wall look very nice. The home and room are very nice! Hey there sweet builds. I really like your work shed build. The way you painted the ground and used moveobjects to create a work area for your gardeners and added some lovely flowers in around the fountain. I really has the look and feel of a indoor-outdoor environment. 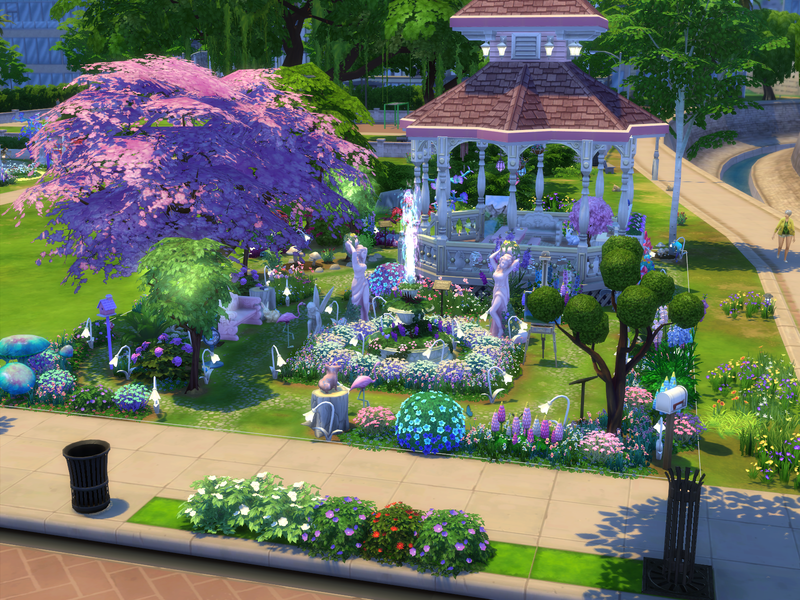 A gardener sims would be very happy here. 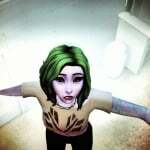 Still play sims 3? learn how to use CFE!!! Pink Bathroom is so very pretty! The pink colour scheme of the room is very nice. The wall and floor tiling looks nice. The window nook with the plants around the birdbath looks so very nice! The pink curtains look pretty there. Very nice sink counter area in the room. The flower boxes look very nice on the wall over the top of the windows and mirror. 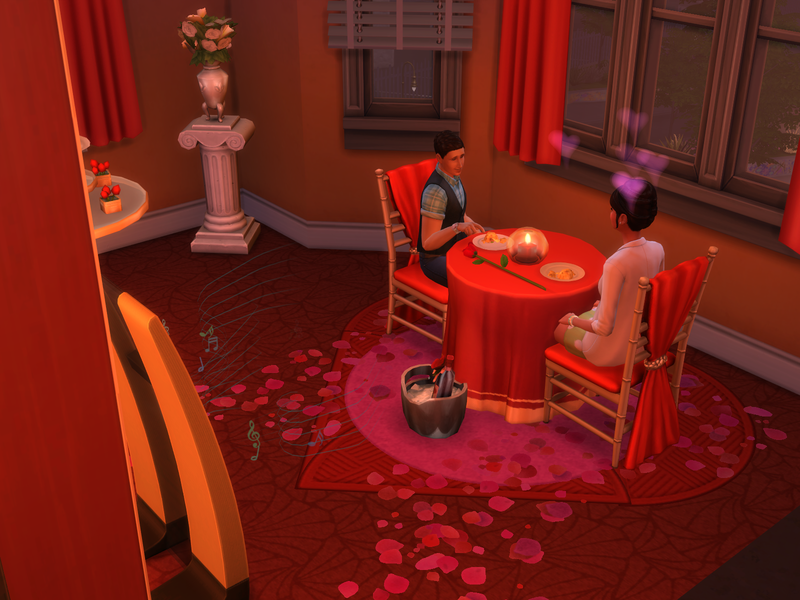 The candles, rose and flowers are nice touches on the counter for sims to see when coming to use the sink. The hanging robes are nice homely touches either sides of the clothes hamper. It is nice that there is the triangular bath tub in the room. Sims will enjoy having a relaxing bath in the tub. The corner nook blinds look great! The towels cabinets look nice how they are placed either sides of the taller cabinet. The candles add a nice look in the room. It is a very nice bathroom! Symphony Orchestra is a very nice music room! Sims will enjoy playing the different types of musical instruments there. It looks nice how the instruments are set up in the room. The music themed pictures look nice on the walls. The Greeenhouse Work Shed room is a very pretty nature themed room The flowers look so very pretty in the room! The water fountain looks nice in the room. Sims will enjoy doing wood crafting on the woodwork table. Nice gardening boxes corner nook for sims to enjoy growing and harvesting plants. The gardening tools are a nice touch on the workbench counter. The grassy floral flooring looks nice. The fruit pictures look nice on the wall and window. Sims will enjoy sitting resting on the seat bench in the room, enjoying the sunshine coming in through the windows and the nice floral setting. The rooms are very nice! 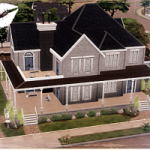 I'm trying to build homes from the 50s here's one I have made from a picture. Oak Alcove reflects your inspiration home so well! Very nice exterior of the home! The green colour of the exterior looks very nice, and the open shutter windows are nice touches in the build to reflect the original home. The flowers look pretty along the edge of the home. Nice art nook corner on the front porch. Sims will enjoy painting in the outdoor air on the easel. Very nice layout of the interior of the home. The blue and white colour scheme of the interior looks nice. Nice sofa seat sitting area for sims to enjoy resting there reading a book from the bookcase. The red flooring complements with the blue walls. Very nice kitchen area. The cabinets look nice how they are placed on the wall there"
Under Renovation: Challenge 22 an empty shell lot size: 30 x 20 to Renovate into a Christmas house and only two bedrooms that share a bathroom and here is the empty shell. Under Renovation: Challenge 26 By The Grid of 120 titles. But we need to be careful, these titles will include our patio's veranda's (if any) our house can be single or duplex but our design focus has to be on newly weds or couples with 1 child.